On 10 September 2018, Jack Ma announced his successor and plans to retire from Alibaba Group in 2019 at the age of 54. In a 19 year-in-the-making the success, Ma has led the company from his humble beginnings back in his apartment, to now what is known as an e-commerce giant worth $420 billion today. Along with the announcement, Daniel Zhang was named the successor of Ma as Executive Chairman of Alibaba Group. Jack Ma is notably the face of Alibaba, however, there are in fact, 17 other significant individuals that co-founded the e-commerce giant since its inception in 1999. But who are they? To uncover the 18 founding members of Alibaba Group, we embarked on a study to find out how Ma met his founders and how he got them on board to realise the e-commerce vision. 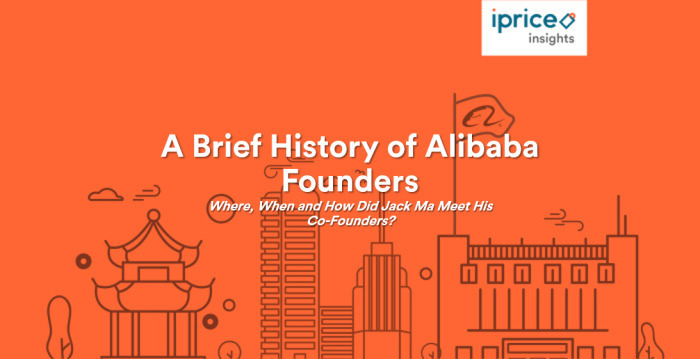 From this report, iPrice Insights found several unique insights on how Ma met his founders. Among the key findings was that Ma’s connections were established through his avenues such as his ex-students, ex-colleagues, mutual friends and like-minded entrepreneurs. Additionally, the founders had prior experience in diverse industries such as journalism, investment banking, web developers, education and many others. 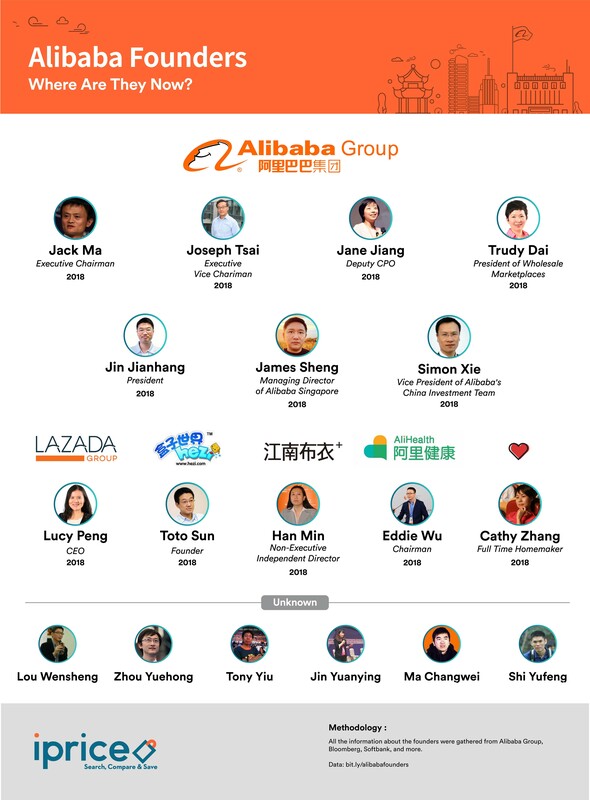 The diverse number of expertise in Alibaba’s founding team was hugely beneficial in the long run and was unlike other successful tech giants where they usually had three or fewer number of founders. As such, Ma’s 18-person team of founders were able to achieve success at a rapid pace, making them the 2nd most valuable companies in Asia in 2018. Ma’s big vision for e-commerce was highly convincing as well because he was able to persuade a number of exceptional individuals to join him in his risky venture. Among the founders was an investment banker, Joseph Tsai, who took a major pay cut from a US$700k annual salary to a US$50 monthly salary to join Ma’s business venture. Over time, his move proved to be the best decision as Tsai is now the Vice Executive Chairman and co-founder of Alibaba Group and ranks as the second-largest individual shareholder after chairman Jack Ma. Amongst the 18 founders were six women who now holds top-level management roles, such as Lucy Peng. She was recently appointed as the CEO of Lazada in March 2018 while a majority of women founders’ members still hold significant roles within Alibaba and its subsidiaries today. Ma has publicly stated “one of the secret sauces of Alibaba is we have a lot of women”. Previously, Ma stated that 47 percent of Alibaba’s staff consisted of women and 33 percent of them held senior roles. More importantly, the stories mentioned above were just a few of the many unique stories of how Ma met his fellow founders prior to the infamous apartment meeting in 1999. Ma was born on September 10, 1964, in Hangzhou, China, at the time of communism. In 1988, Ma successfully earned his degree in English from Hangzhou Teacher's Institute. Later, Ma even became an English and International Trade lecturer at the Hangzhou Dianzi University. Eventually, he ventured into business and founded China Yellow Pages, the first Internet company in the country. Later in 1999, Ma initiated a meeting in his apartment together with his 17 founders to develop their first eCommerce venture which is now known to be the giant Alibaba Group. Today, Ma is the CEO and Chairman of Alibaba which has grown exponentially since its inception in 1999. Currently, Alibaba has more than 79 million users in 240 countries with six active subsidiaries namely: Alibaba.com, Tmall.com, eTao, Alibaba Cloud Computing, Taobao Marketplace, and Yahoo! China. At age 54, Ma announced his retirement as Chairman of Alibaba Group in one year to concentrate his efforts in philanthropy and education, passing the baton to Daniel Zhang. Tsai has an undergraduate degree in Economics and East Asian studies and a law degree. Prior to meeting Ma, Tsai was an investment banker earning approximately US$700k annually. Deeply inspired by Jack’s charisma and his idea for Alibaba, he made a daring move to give up his high-end job to join Alibaba in 1999 and earned only US$50 monthly. Today Tsai is the Vice Executive Chairman and co-founder of Alibaba Group and ranks as its second-largest individual shareholder after chairman Jack Ma. Similar to Ma, Peng began her career as a teacher at the Zhejiang University of Finance and Economics. She married Sun Tongyu, in 1997. Peng quit teaching in 1999 to join her husband, Sun Tongyu as part of the 18-strong Alibaba founding team. She was recently assigned as the CEO of Lazada following Alibaba’s investment of an additional US$2 billion into the marketplace. Sheng began learning traditional art at an early age. He turned to commercial art and started his career as a designer. He was acquainted with Jack Ma when James’ company was hired to design China Yellow Pages’ website. 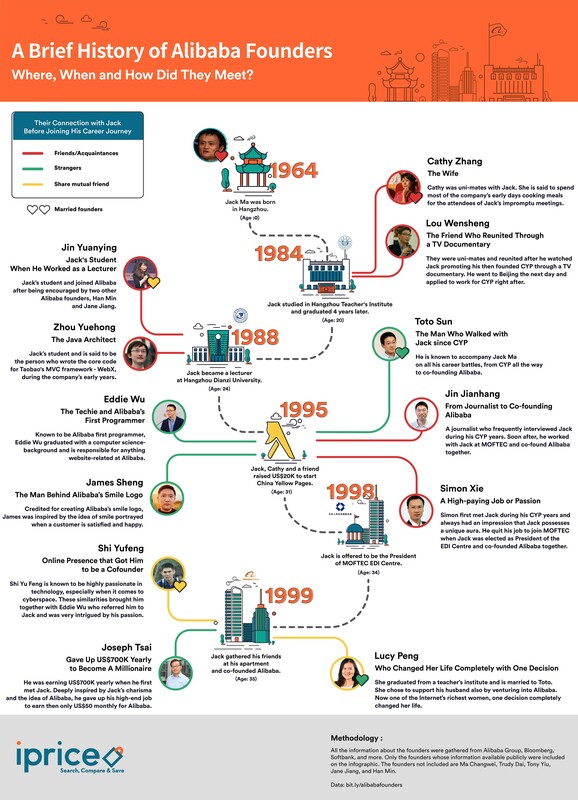 Sheng joined Jack Ma’s meeting in his apartment and became one of the 18 founding members of Alibaba in 1999. Today, Sheng is known to be the man behind Alibaba’s smile logo and is the Co-founder and Senior Vice President of the Alibaba Group. This blog was contributed by iPrice Insights Malaysia.